THE LAST MONTH WAS VERY HECTIC FOR ALL OF US AT BIKE INDIA with the Auto Expo and the Bike India Awards being held in quick succession. A number of motorcycle manufacturers seemed to have decided to give the Auto Expo a miss, two of the biggest of them being Bajaj Auto and Royal Enfield. Although quite a few motorcycles and scooters were unveiled at this year’s event, very few of them were actually launched. The press conferences scheduled back to back make it more or less impossible to attend most of them and even if you make it to the press conference, it proves pointless, for all that you get to see are the backs of the photographers. No wonder a number of manufacturers are having second thoughts about whether it is worth their while to be present at the Auto Expo. This year there were many strong contenders for the Bike India Two-wheeler of the Year Award. Most of the 22 contenders were premium bikes from Triumph, Ducati, Suzuki, Avantura Choppers, Honda, and the latest entrant, BMW Motorrad. Since affordability is very important for the Indian market, the KTM 390 Duke walked away with the Two-wheeler of the Year Award. Last month I rode the first production V4 Ducati motorcycle at the Valencia circuit in Spain. 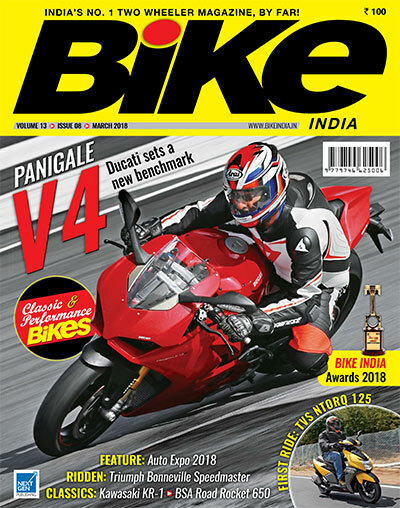 I have ridden most of the litre-class superbikes on racetracks and they all feel like 1,000-cc superbikes, but the Panigale V4 has set a new benchmark in the segment.